Hi everyone! 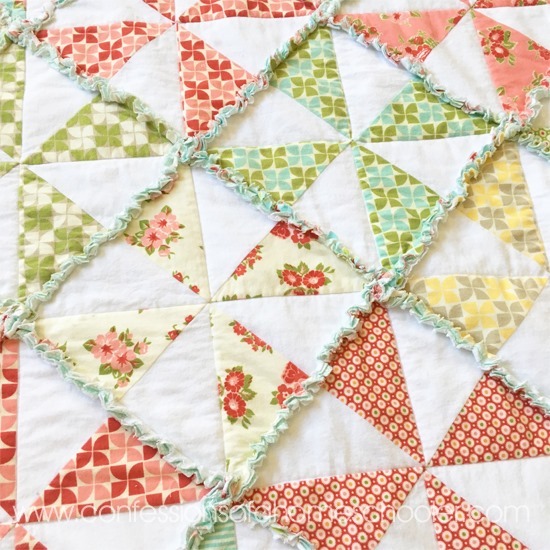 I had such a great response from my original How to Make a Rag Quilt tutorial that I thought I would do another one, this time with a fun twist! Pinwheels! 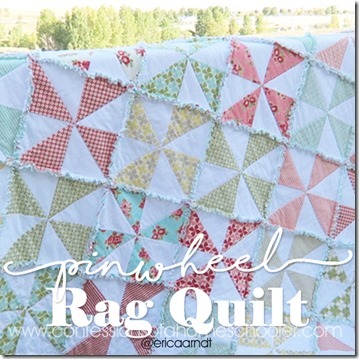 Download the Pinwheel Rag Quilt PDF Instructions here. I used all flannel for this quilt and oh my word, it’s so soft and squishy it will be perfect for those chilly winter nights! 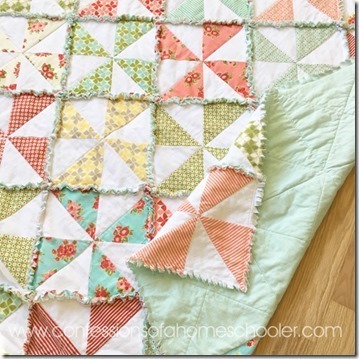 I used Marmalade by Bonnie and Camille for Moda on this quilt. Unfortunately it’s out of print now since I’ve been hoarding it for about two years, but they release new lines regularly so I’m sure you can find something similar that is available now. My favorite spots to get fabric are Fat Quarter Shop and Catching Stitches! 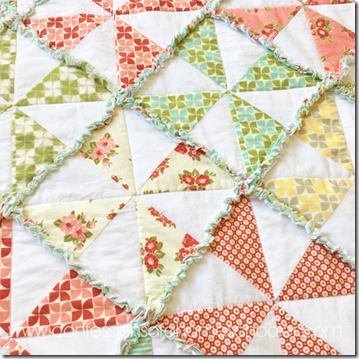 Rag Quilts are perfect for beginning quilters because they’re so forgiving! 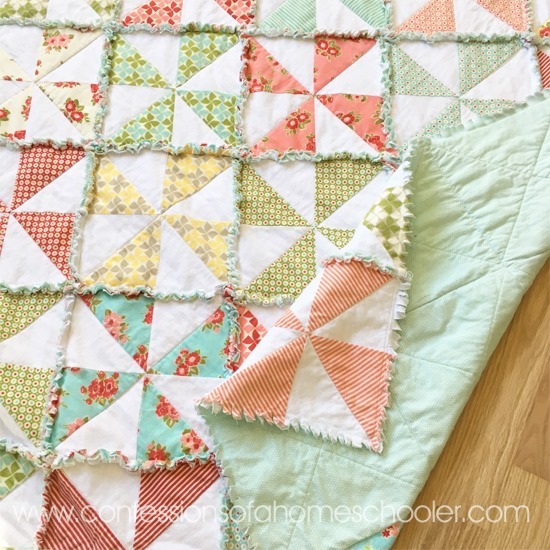 Even if your blocks don’t match up perfectly, no one will ever notice since the seams are all cut and ruffled! 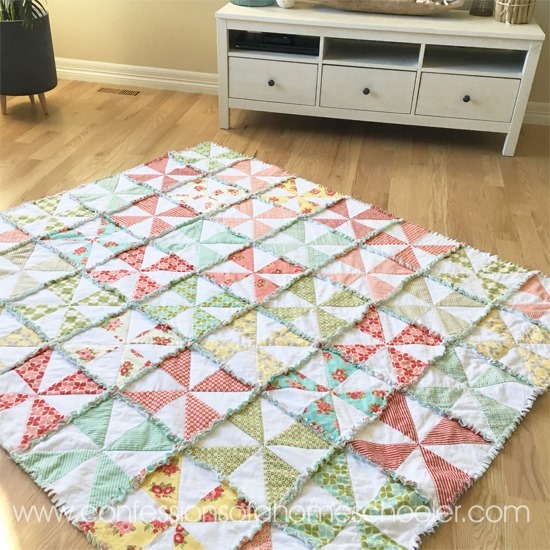 Here’s the finished quilt, it’s approximately 72” x 80” (6 blocks wide by 7 tall), but of course you can easily add/remove blocks to make this quilt any size you like! Love this tutorial! I looked up your Panasonic iron that you mentioned in your video. I’m in the market for an iron. Am currently looking at the Panasonic cordless or the Oliso pro. Do you have any experience with the Oliso so as to compare the two? 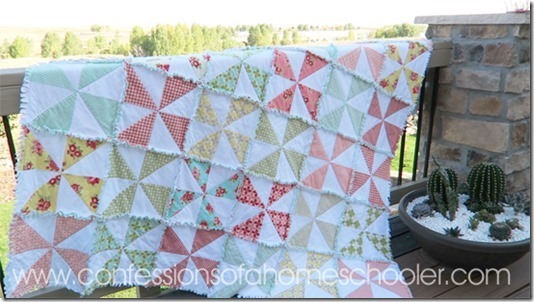 I enjoyed watching you make this rag quilt. You always explain the process very well. Love the pinwheels and your prints are so pretty. 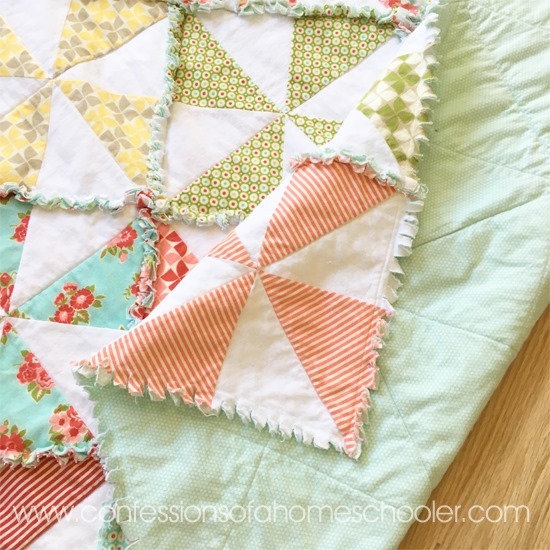 Thank you for teaching us how to do a pinwheel rag quilt. 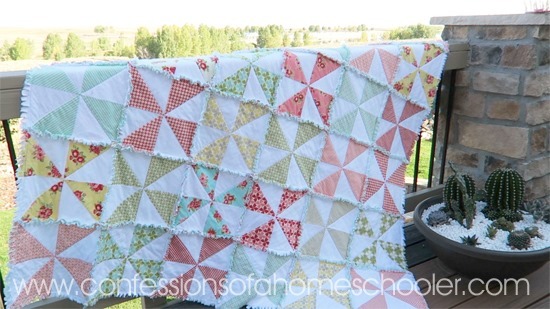 Could you make this quilt using 12.5×12.5 for the batting instead of the 10.5×10.5? Why do you make the inside sandwich smaller? Yes, of course. I just did it both ways to show that it can be done either way 🙂 If the middle layer is the same size it just creates a fluffier/thicker rag layer. But you can do it either way.